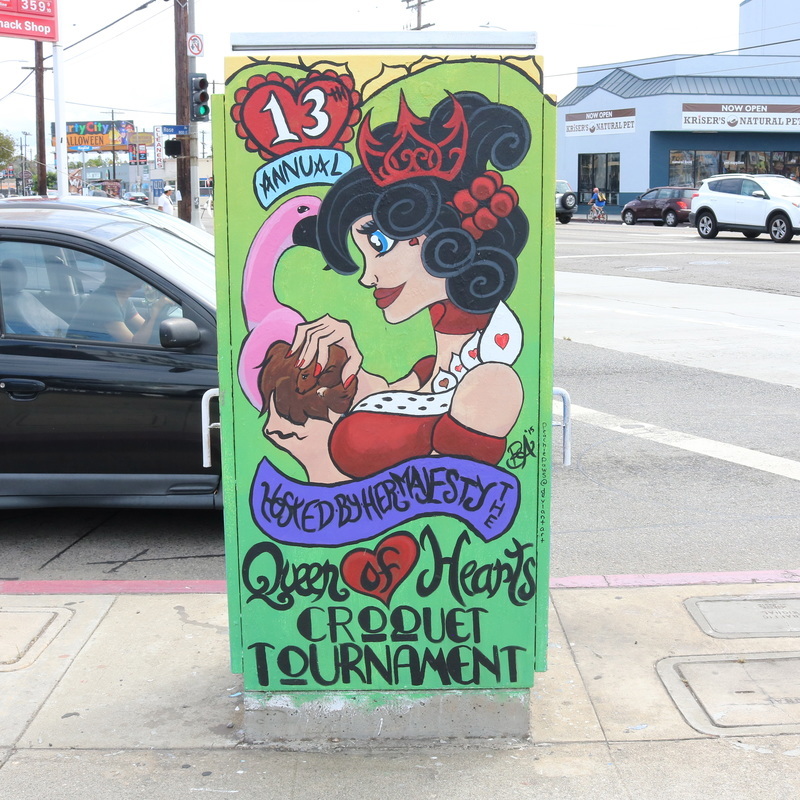 Los Angeles' Historic Highland Park has begun a Keep It Clean Initiative in the neighborhood, to engage the community and businesses in keeping Highland Park beautiful and clean. 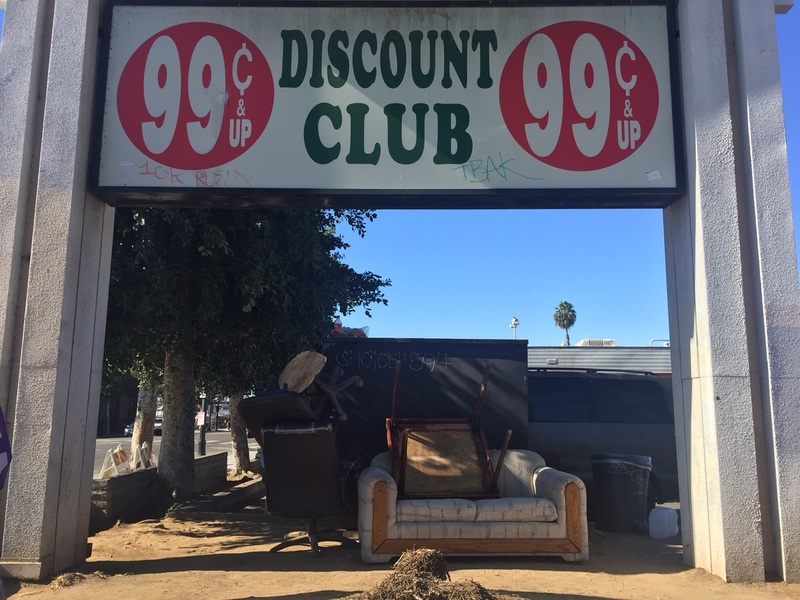 According to their Facebook page, here's the story: "The City in partnership with community members, organizations, schools, churches and businesses will launch the Highland Park ‘Keep It Clean’ effort to keep Highland Park clean through educating community members to take responsibility and report illegally dumped furniture (bulky items), graffiti, potholes, trash and other items by reporting them on the 311 app. Residents will be assigned as block captain or apartment building captain and host a 311 app training on their block or building to train neighbors on how easy it is to report bulky items and trash. #90042KeepItClean"
The first "Keep It Clean" event in Highland Park was held on Saturday, October 22, 2016 at Monte Vista Elementary School. 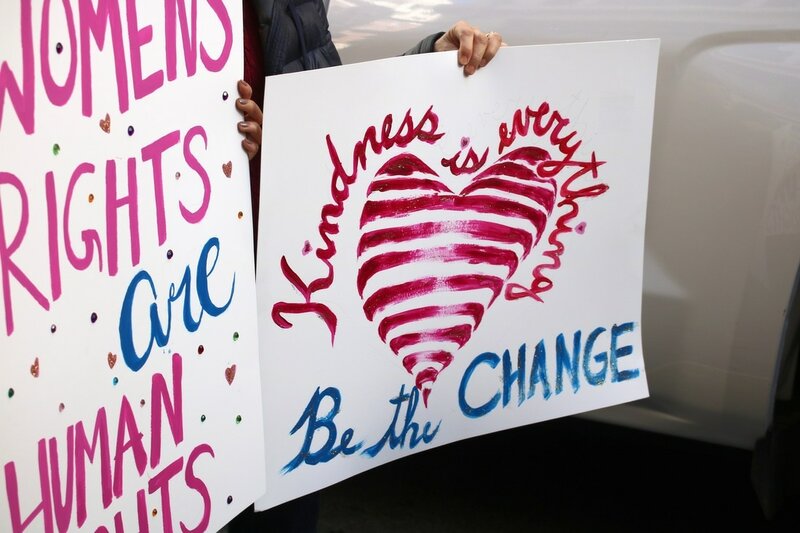 The event was hosted by hosted by Gil Cedillo of LA CD1, the Historic Highland Park Neighborhood Council and Chamber of Commerce and other community members. 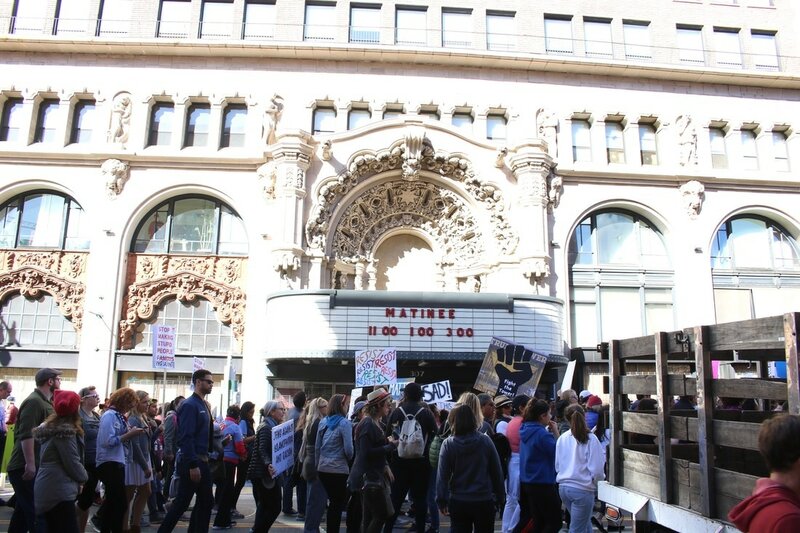 101 total volunteers showed up at their first clean-up event (how's that for awesome?) and we all put our helping hands together to clean a total of about 20 blocks around the Highland Park neighborhood. 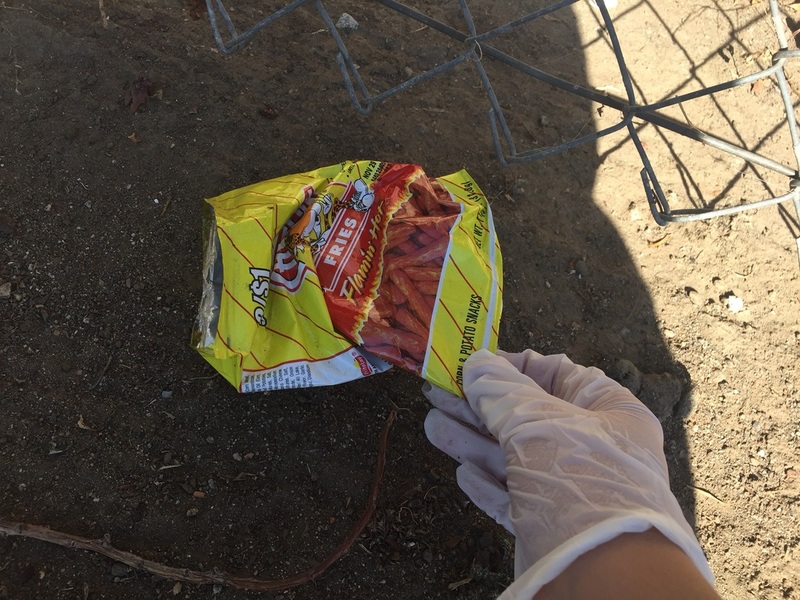 From picking up many pieces of trash (I couldn't believe how many cigarettes, chip bags, and soda bottles we found), to using our MyLA 311 apps to report abandoned items on the sidewalks (bbq grills, shopping carts, couches, etc.) and the many sightings of graffiti around the neighborhood. The app was easy to use, and you are able to pinpoint your exact location, upload a picture of what you are reporting, and share any additional details with the City of LA. The app then creates a service call to the city and our reports on Saturday were all expected to be completed for clean up by Tuesday, October 25. How cool is that?! 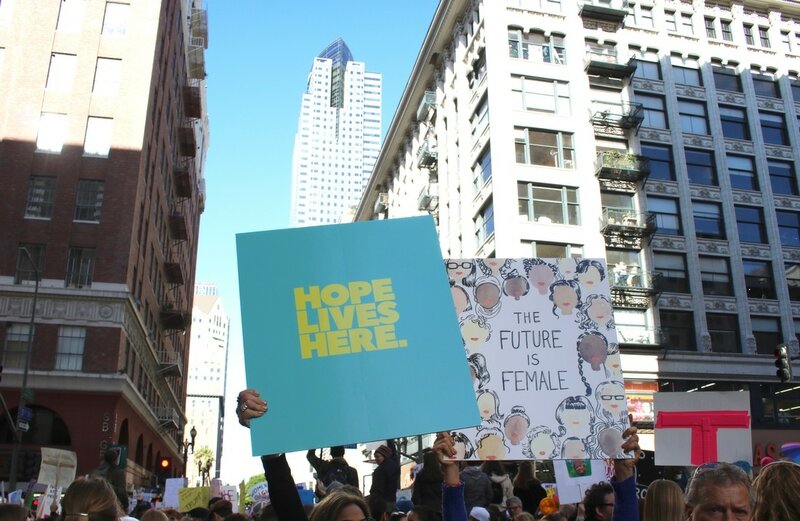 Go City of LA! After 2 hours of trash clean-up in the hot fall sun, I was feeling pretty wiped out. But it was entirely worth it seeing the multiple trash bags FULL of litter that we collected. Part of being a productive and meaningful member of society here in Los Angeles is giving back to our community, in whichever way you can. 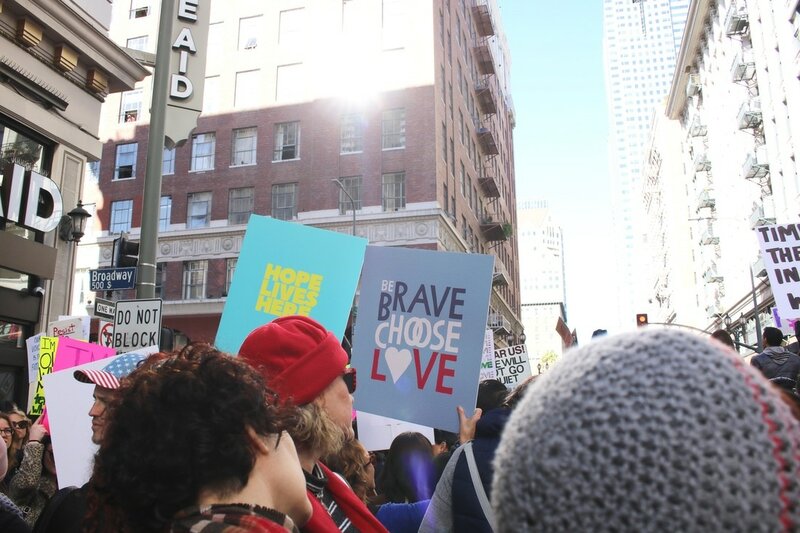 It would be disingenuous for me to share how much I love Los Angeles without recognizing that there is much work that needs to be done to make our community a better, safer, and more beautiful place. As I continuously ask myself how I can get more involved and give back to the city that I love so dearly, I urge you to do the same. Feel free to share with me any of your upcoming non-profit events in the community, and I will make it if I can! 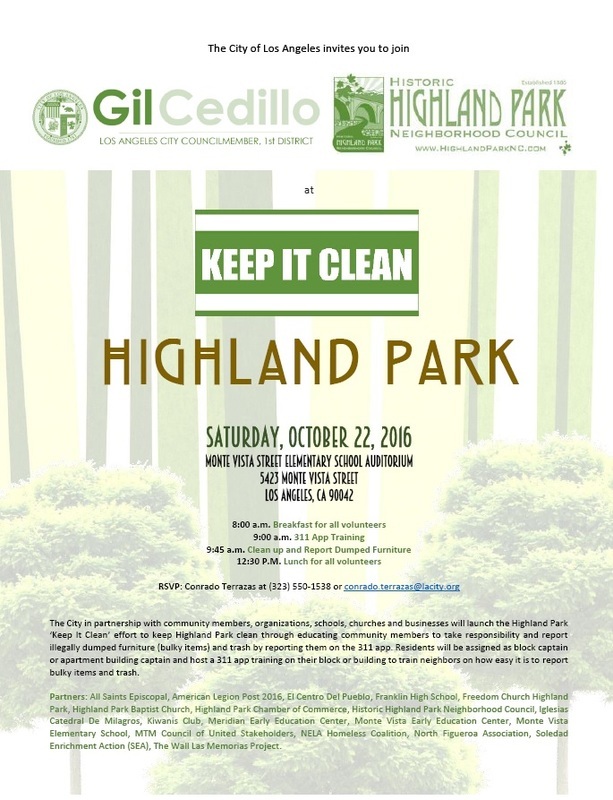 For more Keep It Clean events in Highland Park, stay updated by liking their Facebook page. For more information on the MyLA 311 app, click here. 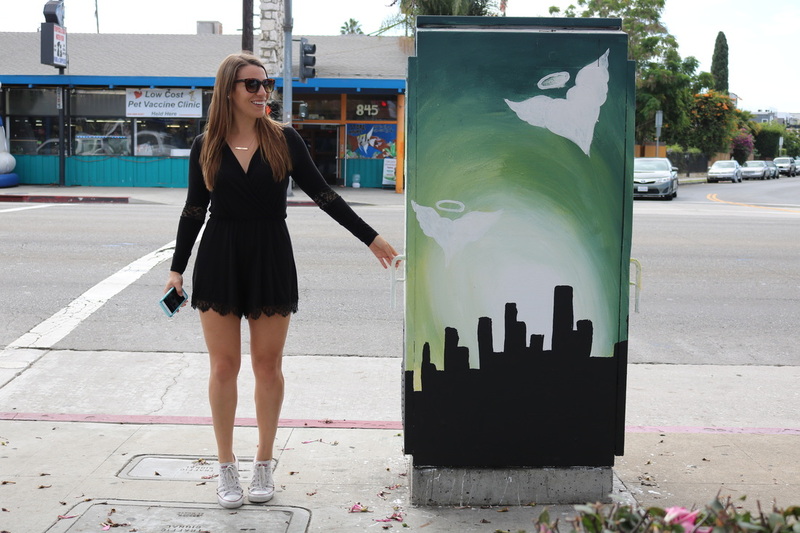 MyLA311 links Angelenos with the services and information they need to enjoy their city, beautify their community and stay connected with their local government. 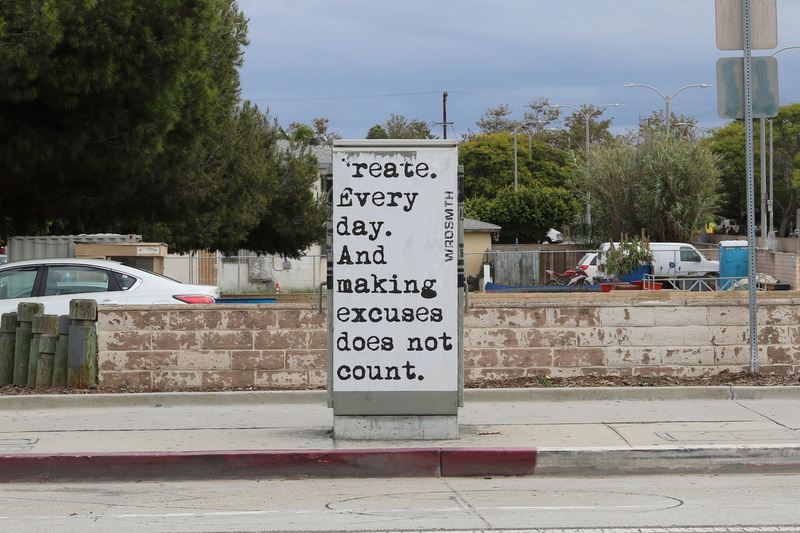 This is a great resource for all LA residents to report trash, large and abandoned items on the side of the street, graffiti, potholes, and illegal activity anywhere in Los Angeles. 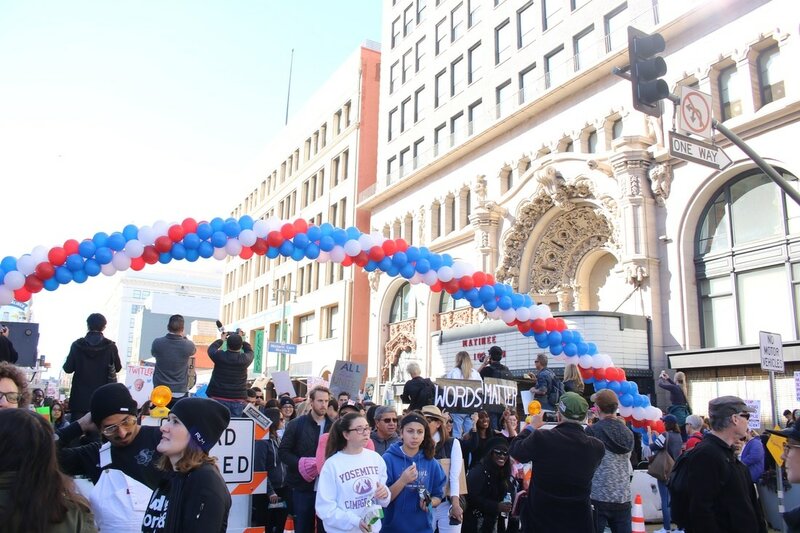 For more clean up events or volunteer opportunities in Los Angeles, visit the following links. 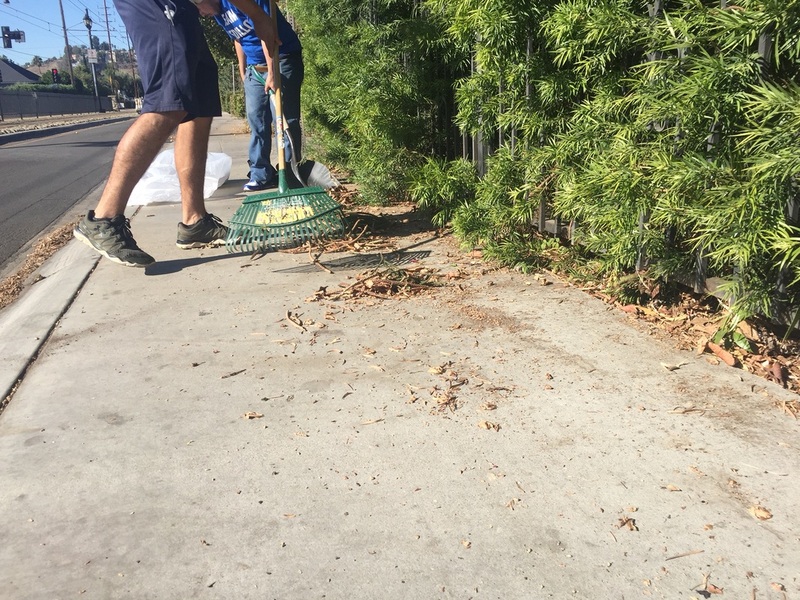 Regardless of whether or not you're able to attend a local clean up in your LA neighborhood, let's try to keep all of L.A. beautiful (and clean), folks! 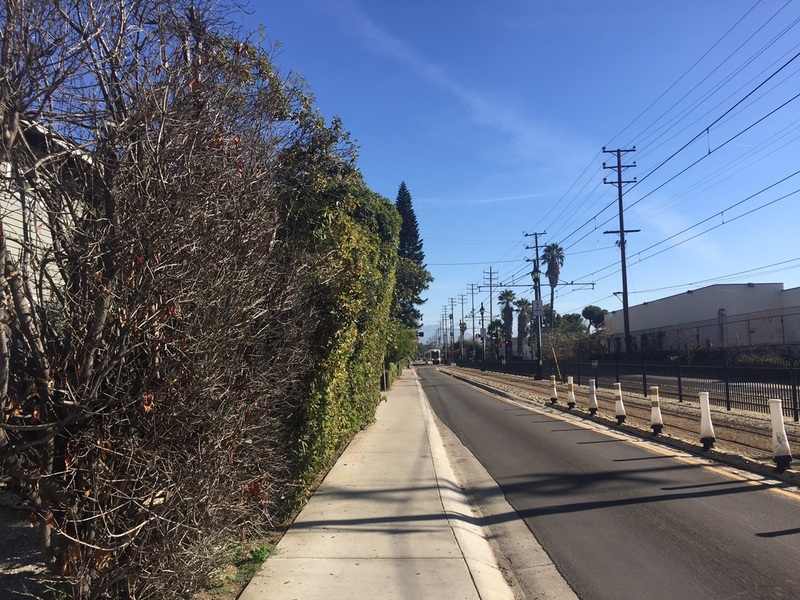 Pick up after yourself, collect any trash on the sidewalk if you see it, and use your My LA 311 app on your smartphone to help keep our community clean. I love to explore Los Angeles in my free time and share off-the-beaten-path adventure ideas with my readers (there was more than 20,000 views and 6,000 new visitors to my site last month - THANK YOU!) and social media followers. I think I like doing this so much because I have personally gained joy and fulfillment from saying “yes” to more adventures and learning about the city I live in, and in turn, hope that others can gain something from getting out and about more. 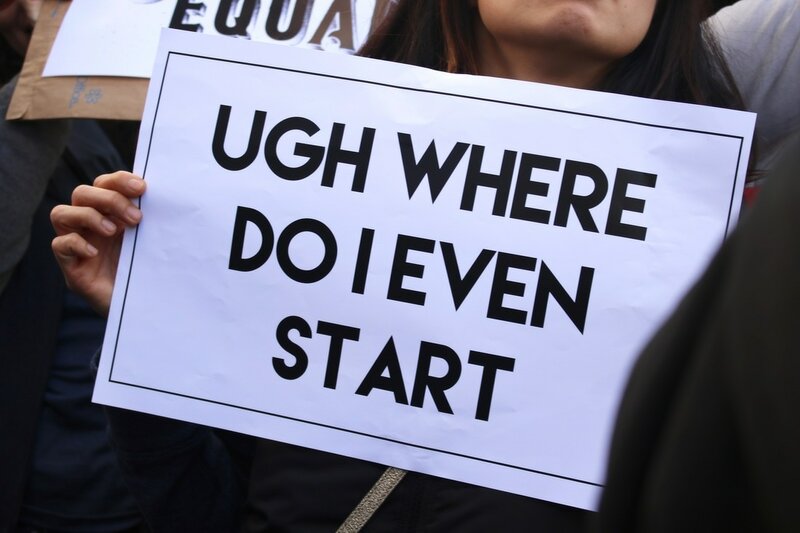 It wasn't too long ago when I would spend my weekends watching Netflix, eating junk food, and laying around looking at every social media site possible for hours (I am NOT condemning these actions - but for me, they weren't adding a whole lot of fulfillment to my life). So, starting a blog about Los Angeles tourism has benefited me, my mental wellness, and my outlook on life in more ways that I can express. 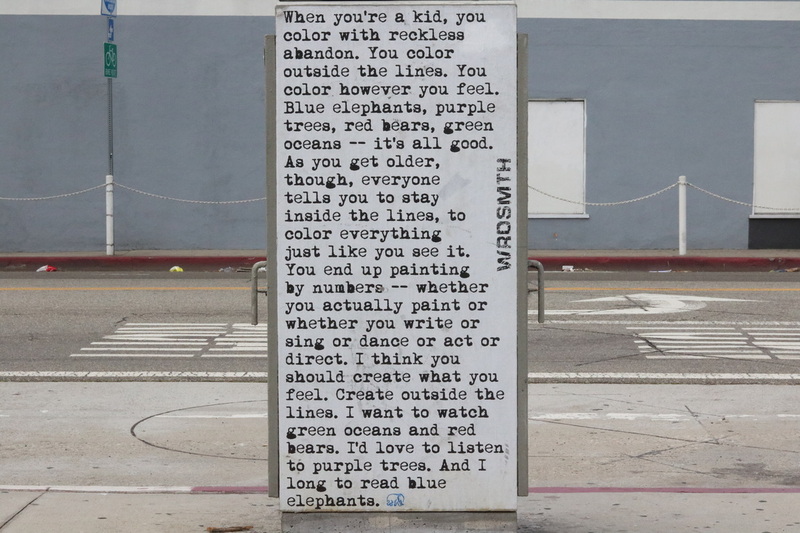 I do want to acknowledge, though, that I am able to experience Los Angeles from a perspective that not everyone shares. I work full-time during the week and have the financial means set aside money from each paycheck for “fun funds.” I have a car to drive myself around Los Angeles and never have to worry about how I'll pay for that next tank of gas. I am able-bodied and can walk up and down stairs, go on long hikes, and explore the world on my own two feet. I live in a single apartment and do not have any family members under my care, either physically or financially. English is my first language, so it is easy for me to communicate with others in the city whilst out and about. I am not writing these to discount my hard work or to invalidate what other people similar to me have accomplished; I am writing this to acknowledge that not everyone has the same ease of access to Los Angeles adventures that I do. I think we, social media peeps and bloggers, can sometimes easily promote the idea of, “If you just follow your dreams you will live a beautiful life!” or, “You can accomplish anything if you just try hard enough!” or, “Come on! Explore! Get out there!” I want to acknowledge something important that I think doesn’t get mentioned enough in the world of blogging: there are situations and life circumstances that may prevent, or make it more difficult, for others to experience travel and tourism. While I want to encourage others to get lost in this mecca we call Los Angeles, I realize that we all have different obstacles to overcome. So, what can we as a blogging community do to connect with more Angelenos? I’ve learned that just because I’m able to share my view of Los Angeles from the camera I hold, doesn’t mean I can’t try to see our city through someone else’s lens. 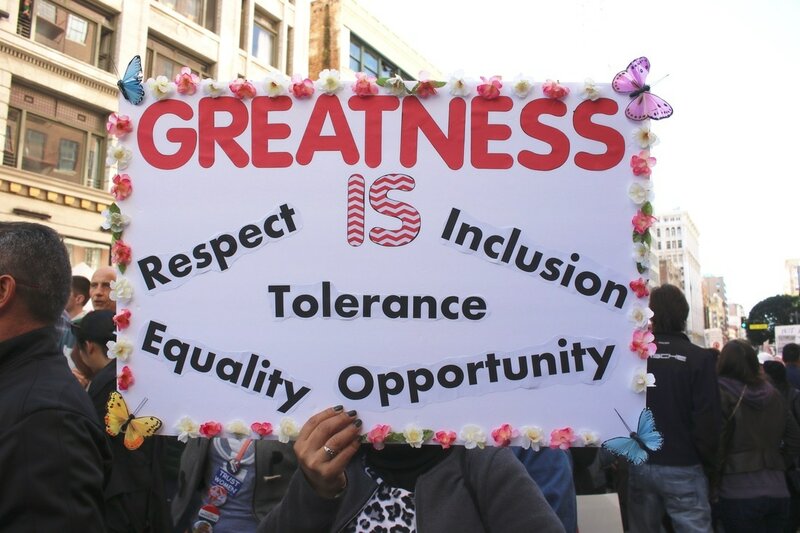 I think we can start with acknowledging our own privileges and think about socio-economic differences when sharing ideas and inspiration related to fashion, travel, food, and more. I try to make an effort to share budget-friendly LA adventures, but what I perceive as “budget friendly” may not be to another. What I could exclaim as “affordable” may still be out someone else’s budget. 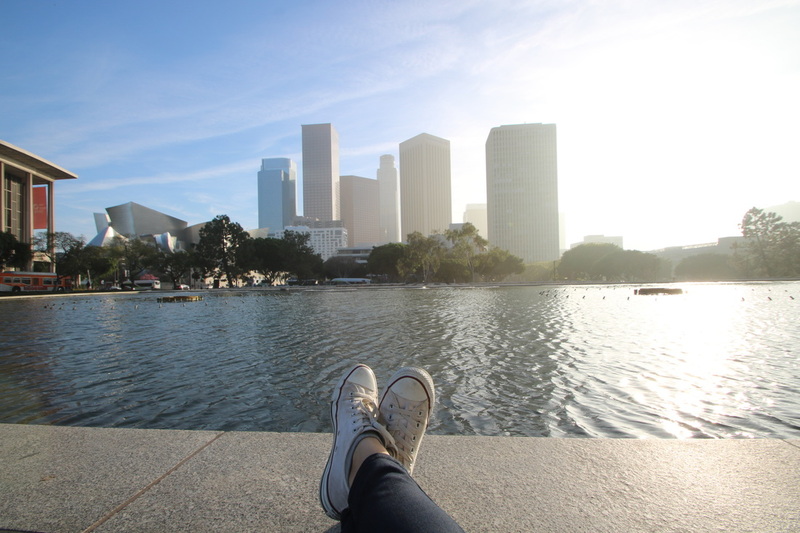 Because of this, I put together a list of my favorite and actual no-cost downtown Los Angeles adventures. 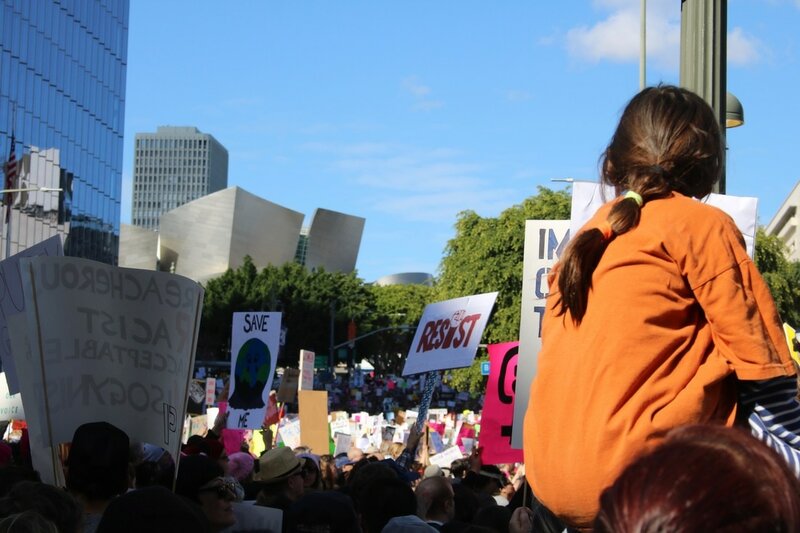 This guide does not include ideas on low-cost transportation, but I encourage you to read more about Los Angeles' public transportation here (thanks to my friends at the LA tourism board!). While I may not be able to provide content that is relatable to each and every person seeking new experiences in Los Angeles, I can make an effort to craft adventure plans that are more accessible to a larger audience. 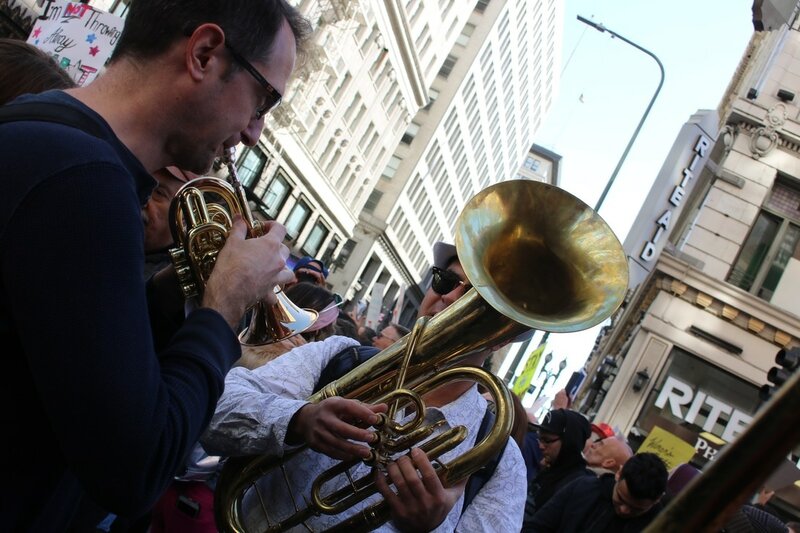 Because of this, I hope you enjoy some free downtown Los Angeles activity ideas below. Feel free to comment with any other suggestions you have for fellow Angelenos! One of my best friends Liz and I ventured out to The Broad Museum on a Saturday evening around 5:00pm. We did not have pre-scheduled ticket reservations, so we were prepared to wait in the standby line. We had our fingers crossed that it would go quickly, but apparently the onsite ticketing line can have a wait of anywhere from 10 minutes to a few hours…Eek! Luckily, we only have to wait about 30 minutes before we were able to enter the museum. 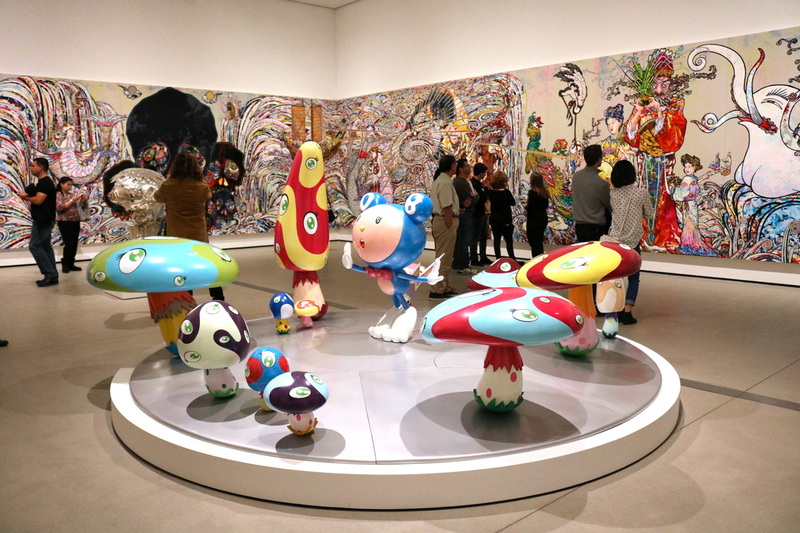 ​While there are over 2,000 works of art in this museum, it felt much more like a comfortable, friendly, and eclectic art gallery than a pretentious museum. 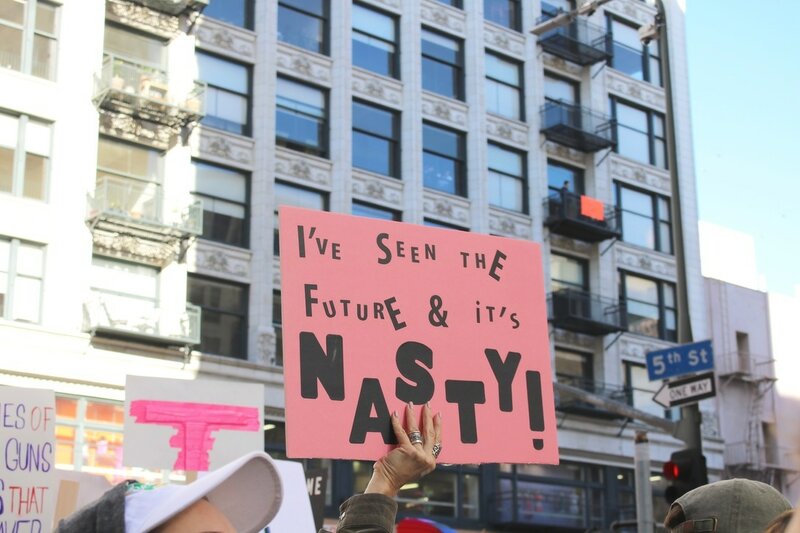 I was pleasantly surprised at how many young people were visiting – a good amount of teenagers and early twenty-somethings – who were perusing the art and enjoying the experience with their friends. 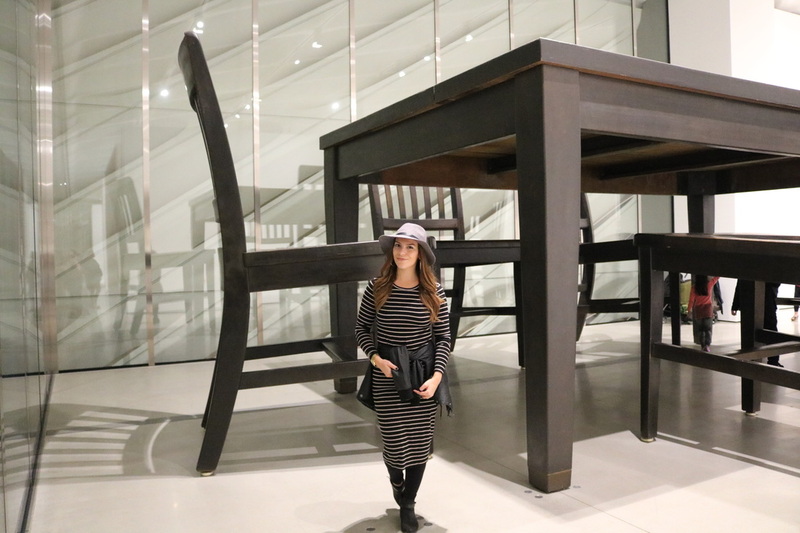 Some of my favorite pieces were Jeff Koonz’ bold and colorful balloon sculptures, Cy Twombly’s abstract art, El Anatsui’s copper and wire “cloths,” and Robert Therrien’s “Under the Table.” This sculpture in particular made Liz and I feel like we were in Wonderland! 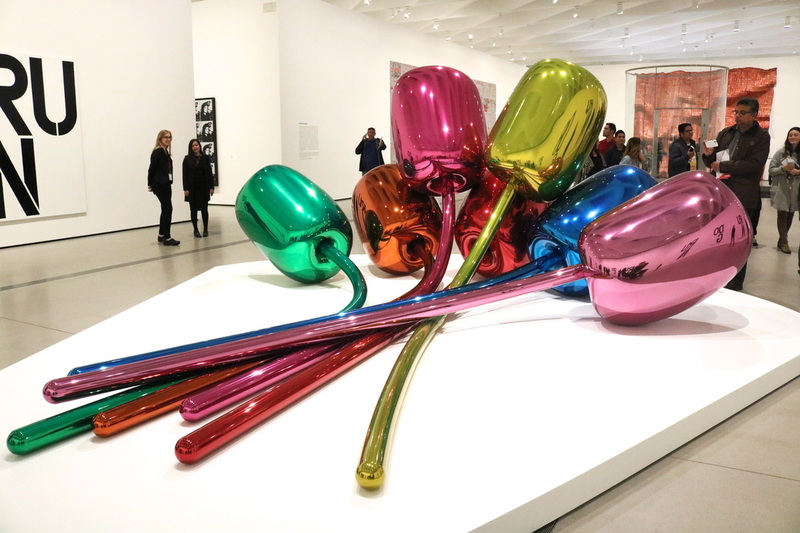 Oh, and of course, Andy Warhol never disappoints. 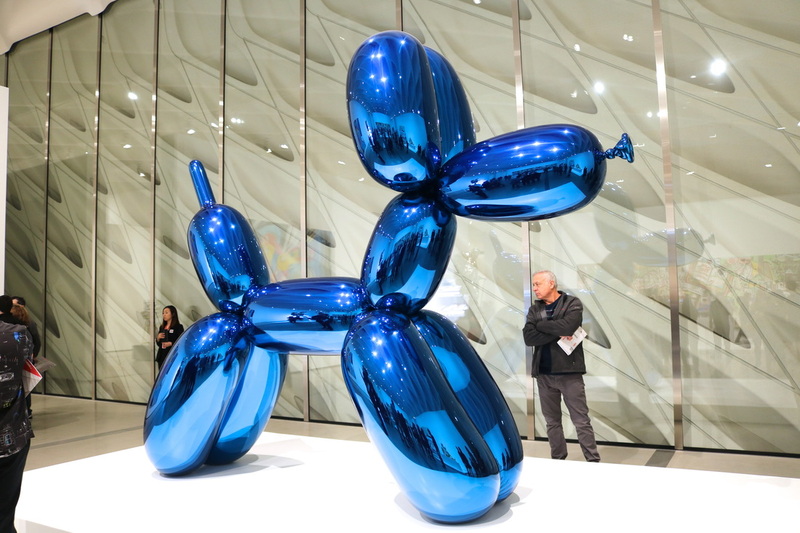 I can’t stress enough how much I appreciate the Broad being free! Reserve free tickets and check out the museum times by clicking HERE. 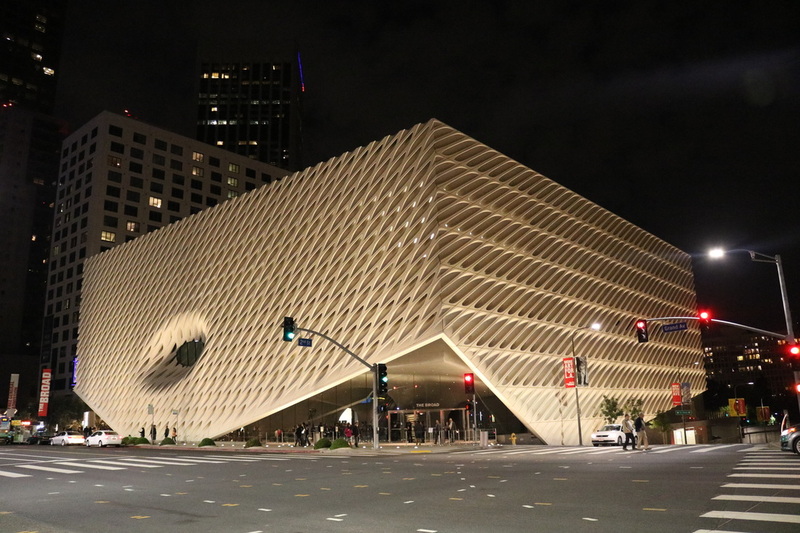 The Broad Museum is located at 221 S. Grand Ave. in Downtown Los Angeles. 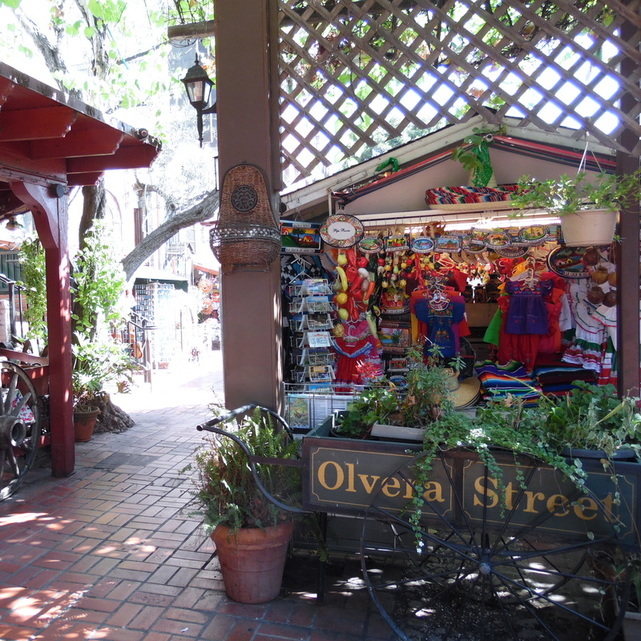 ​Olvera Street is the official birthplace of L.A. in 1781. I went on a short walking tour by myself (literally by myself – no one else showed up for the tour) and had a very friendly, super knowledgeable docent. I learned a brief overview of the history of L.A. and how Olvera Street is now part of the El Pueblo de Los Angeles Historic Monument. 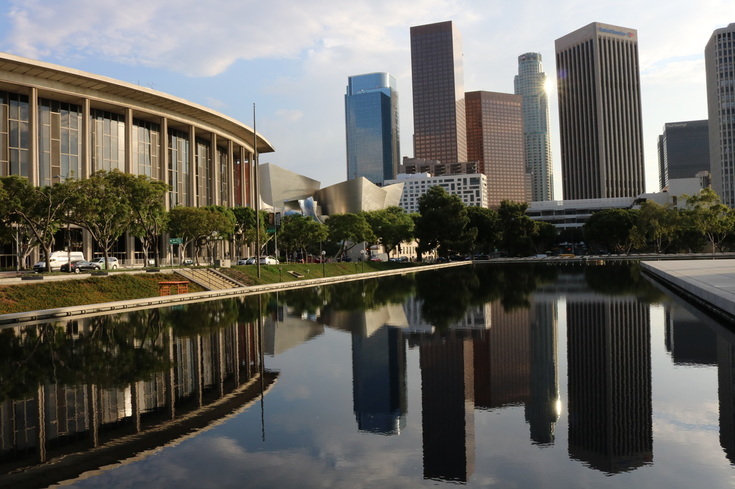 The City of Los Angeles offers free walking tours here which are roughly 1-hour long. 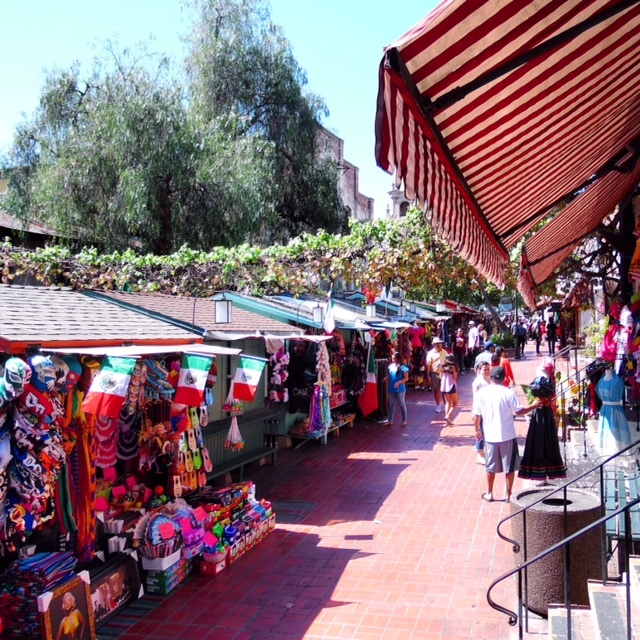 Click here for more information on the free walking tour, or visit Olvera Street on your own at: 845 N Alameda St, Los Angeles, CA 90012. ​You don’t need to dine atop a rooftop in Los Angeles to see sweeping views of the city. Urban picnic, anyone? Pack a lunch and relax at the Department of Water and Power, one of my favorite locations in all of Los Angeles. 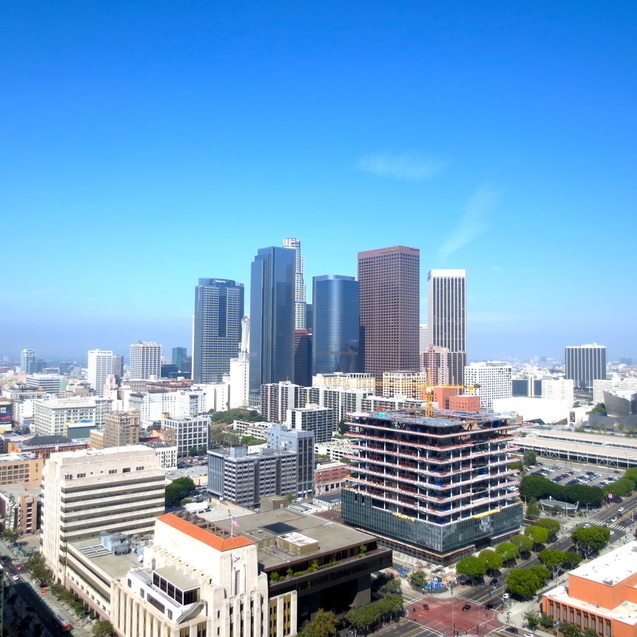 As evidenced by some of the pictures above, the views of the LA Skyline from this building are some of the best in the city. Visit the Los Angeles Department of Water & Power at 111 N Hope St.
​The Last Bookstore is California’s largest used and new book and record store. Downstairs is a ginormous bookstore (pictured above) and the upstairs area includes lofts full of local artists’ studios and galleries. I loved wandering around, exchanging friendly smiles with all of the artists, and briefly checking out the expansive collection of old and new books. The decor is vintage, eclectic and beautiful in a unique way, and it’s truly a book lovers paradise. There are books on sale, of course, but it’s an adventure in itself (and free) just walking through the bookstore. If you decide you want to pay it a visit, don’t forget to look for the infamous tunnel of books on the second floor! 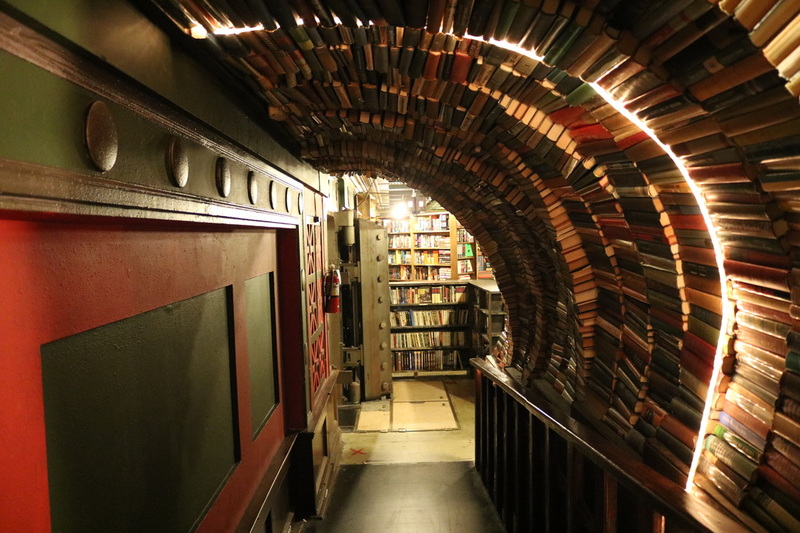 Check out this one-of-a-kind bookstore at 453 S Spring St, Los Angeles, CA 90013. ​“Still splendid more than 100 years after its 1893 opening, its magical light-filled Victorian court, open cage elevators, marble stairs, and ornate iron railings make this one of downtown's most photographed icons,” shared the L.A. Conservancy. 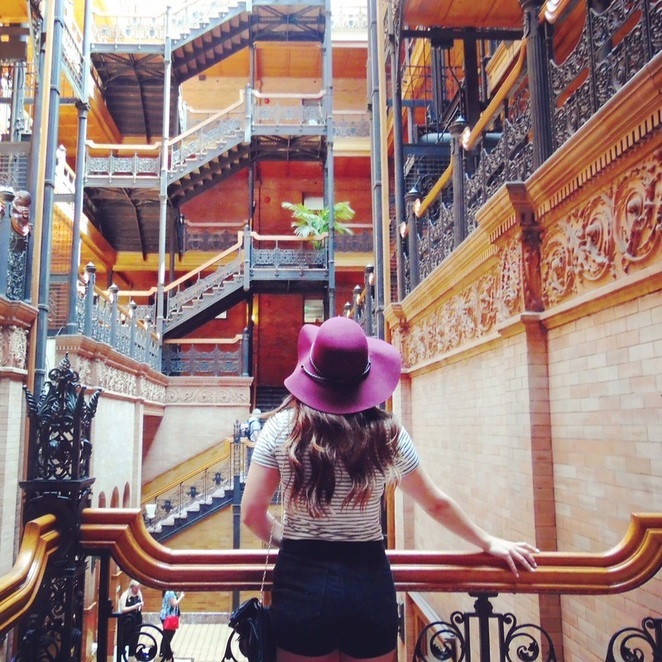 The Bradbury Building is one of the oldest commercial buildings in Downtown L.A., and is definitely one of the most beautiful. Although I was slightly disappointed that guests are only permitted to visit the first floor of the building, I was still amazed at the intricate detail and architectural design inside this historic building. 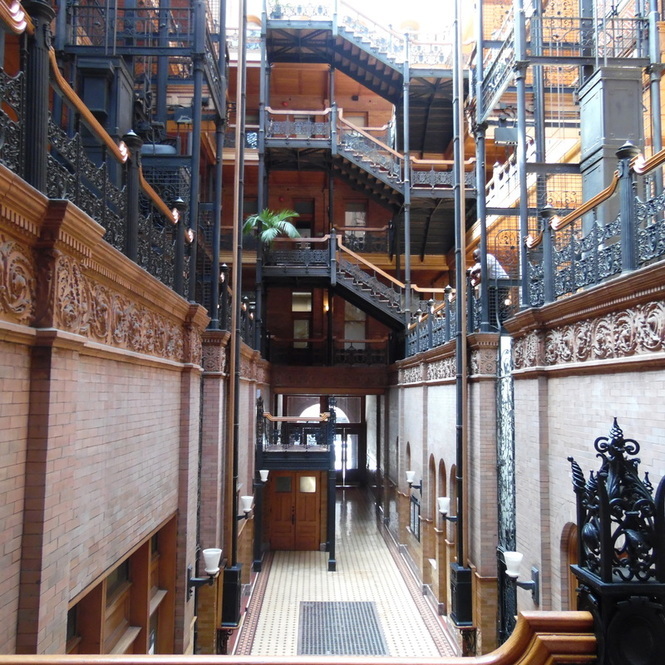 Visit the Bradbury Building for free at 304 S Broadway, Los Angeles, CA 90013. ​Right across the street from Grand Central Market, is the Angel’s Flight Railway. 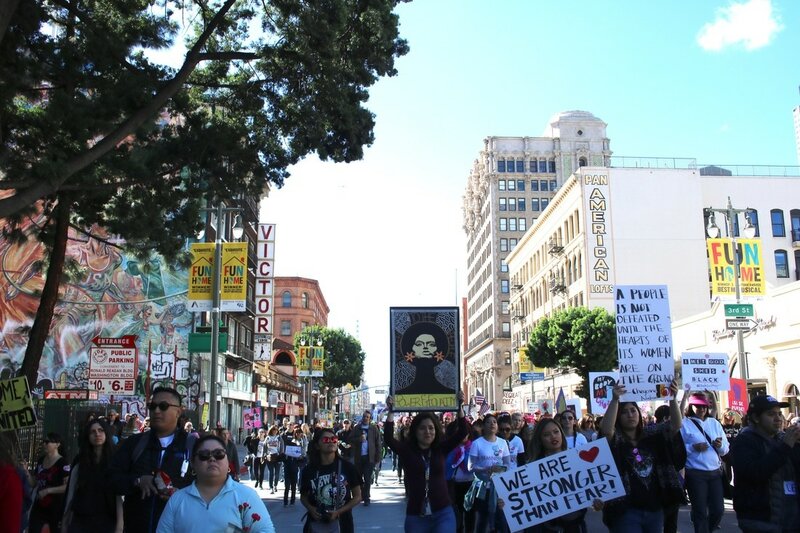 Here’s what the LA Conservency has to say about Angel’s Flight Railway, “Angels Flight Railway is one of Los Angeles' most enduring landmarks. Constructed and opened in 1901, it carried passengers up and down the steep slope between downtown and the top of Bunker Hill, then a fashionable residential district. Billed as the "shortest railway in the world," the funicular has two cars, Olivet and Sinai, connected to the same cable and counterbalancing one another.” The railway stopped running in September 2013, and it has yet to reopen. Although you cannot ride on the shortest railway in the world currently, you can still check out the vintage charm of the railway station and walk up and down the steps adjacent to the railway. 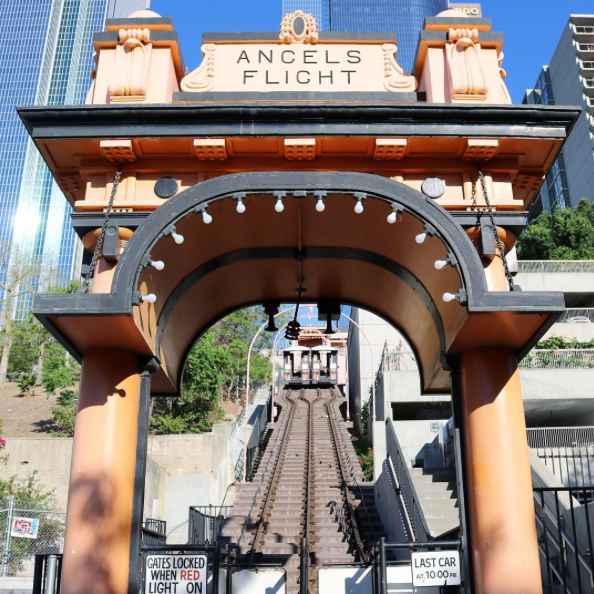 Visit Angel’s Flight Railway at351 S Hill St., Los Angeles, CA 90013. 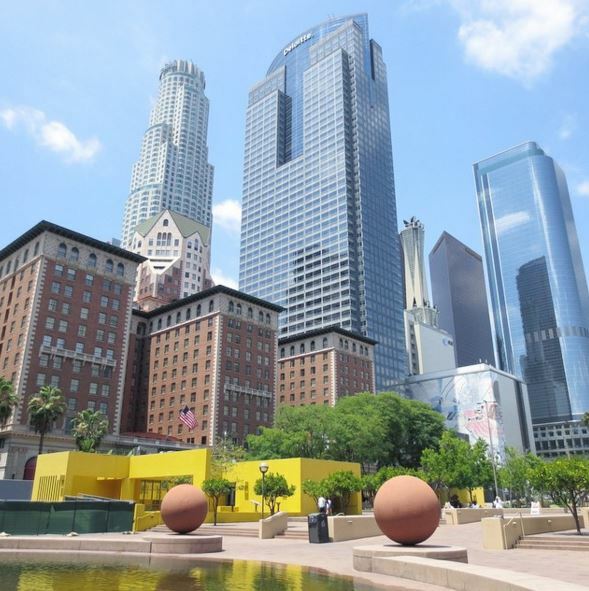 Pershing Square is a public park smack-dab in the middle of downtown Los Angeles. 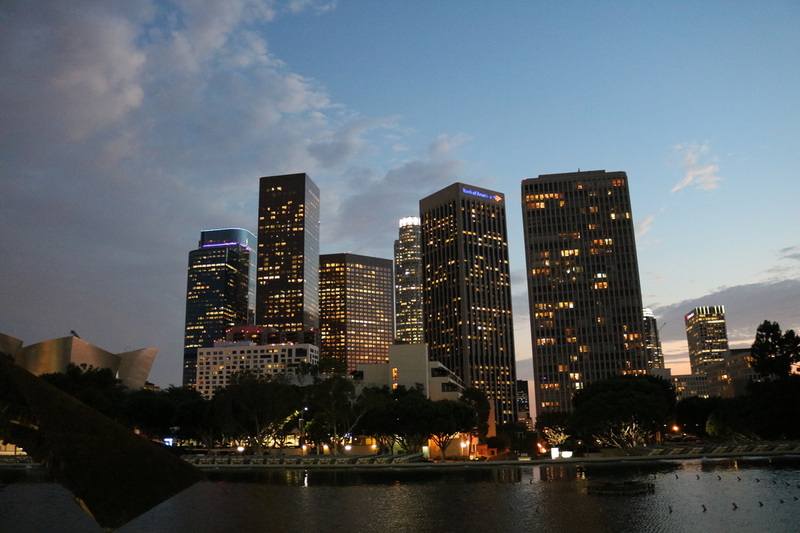 The park is one square block in size and hosts some pretty amazing 360 degree views of the LA skyline. It’s peaceful and quiet place to kick back and relax, would also make for a good picnic location. 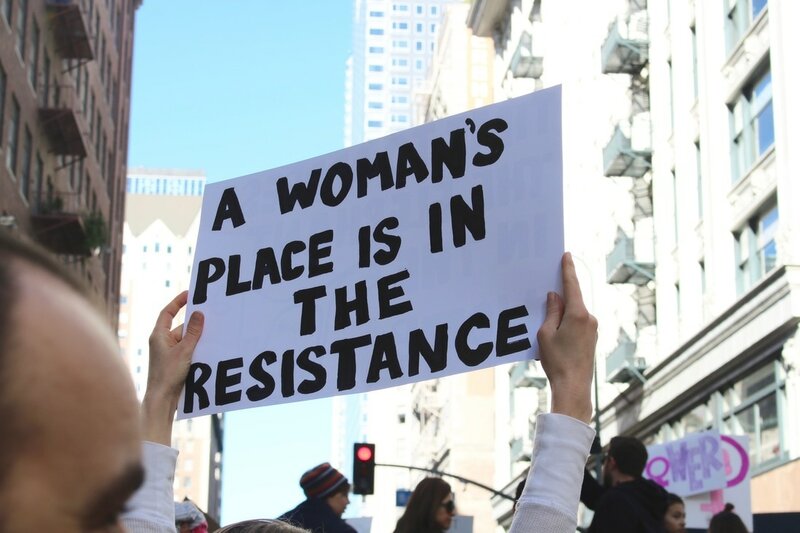 Pershing Square is located at 532 S Olive St, Los Angeles, CA 90013. 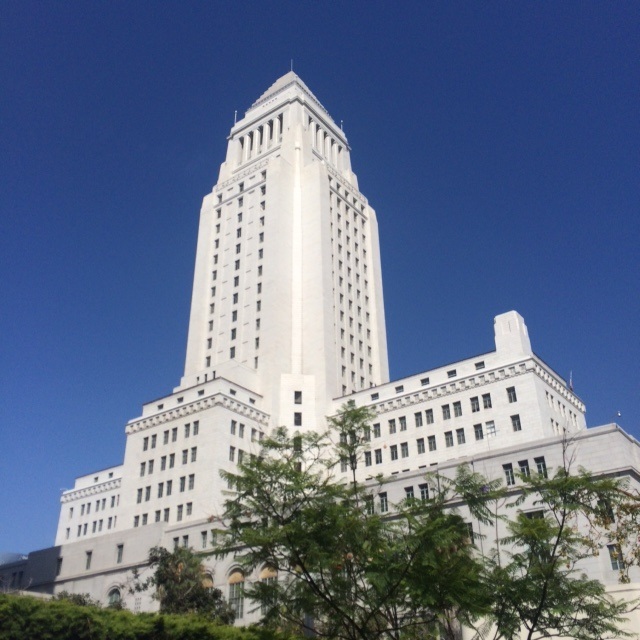 Chances are you probably haven't heard much about visiting LA's City Hall...unless you've done jury duty there or know someone who works there. But did you know you can visit the observation deck on the 27th floor for free and see great views of the city? I loved being able to see one of my favorite buildings in LA - The Walt Disney Concert Hall - from a bird's eye view and also the DTLA skyline which I find myself falling more in love with every time I see it. 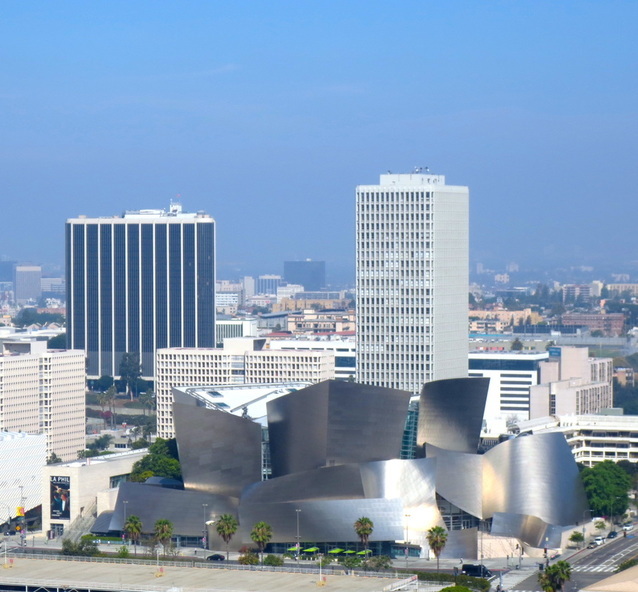 If you are planning a visit to the Observation Deck at LA's City Hall, you will need to bring a government ID (you check in at the front desk and get a visitor sticker. You'll also have to go through a metal detector.) and go on a weekday during business hours - it's only open Monday-Friday from 9:00am-5:00pm. You can walk 360 degrees around the outside deck on the 27th floor and enjoy stunning views of the city. LA's City Hall is located at 200 N. Main St. in downtown Los Angeles.